I don’t envy any new tapas restaurant opening in London. Unless you’re as good as José or Ember Yard, or as cheap as Barrafina, then it’ll be a real struggle to stand out. Bilbao Berria tries to rely on three things to set itself apart – a menu with alleged Basque and Catalan influences, a celebrity chef and glossy surroundings. I’m barely aware of Masterchef since I watch hardly any TV these days, so the fact that the kitchen is headed up by the 2011 winner of the cooking contest show matters little to me. The gilded surroundings certainly are pretty, but ultimately it’s all about the food. The Flame Haired Squelchie is one of my most trusted and beloved dining companions, so it’s a shame that one of her last meals as a full-time Londoner wasn’t a rousing success. 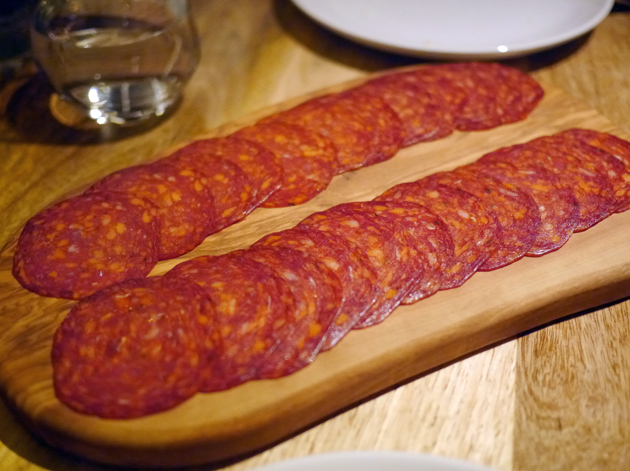 Our meal started off well enough with a board of chorizo. Although the thin slices were slightly sweet and reasonably moreish, they were somewhat devoid of fat. How do you pronounce chorizo? 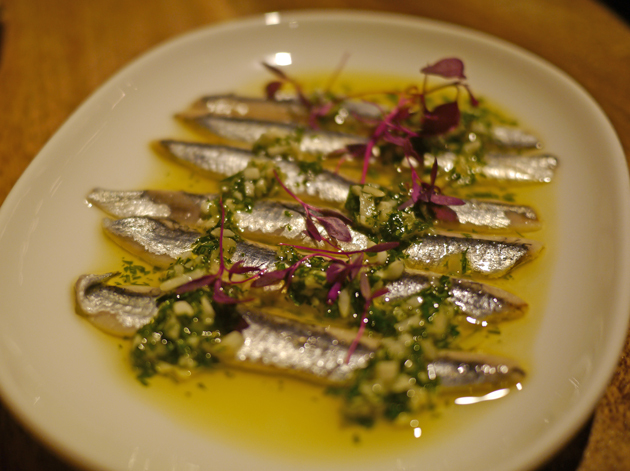 The Cantabrian anchovies were an outright disappointment – the normally distinctive salty tang that’s so evocative of the seaside was very muted here. The dominant flavours were instead those of the garlic and parsley dressing. I’ve never been a huge fan of Spanish cheeses, and the the hard Basque sheep’s cheese served here doesn’t change my mind. 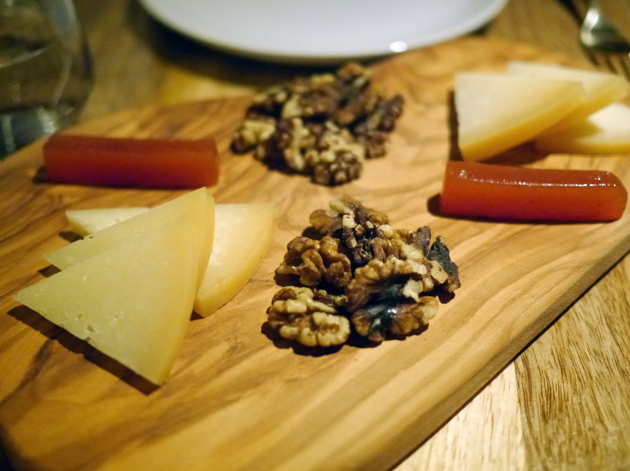 Apart from a mild earthiness, it was really rather ordinary with the muted quince jelly and walnuts failing to either compliment the cheese or contrast with it. 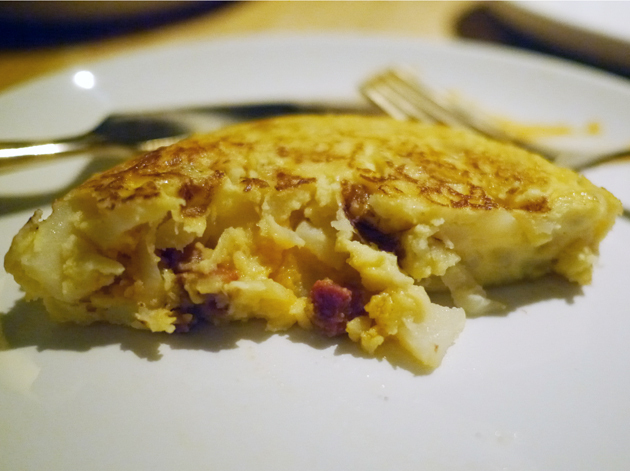 Although the tortilla was soft, fluffy and mildly eggy, the promised chorizo manifested itself only as a few small, solitary flecks that failed to leave much of an impression. Hold on, I need my glasses. 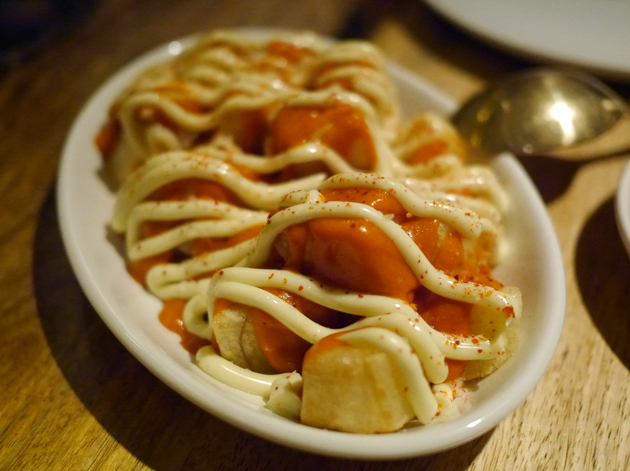 The patatas bravas is allegedly triple cooked, but the soft, ordinary chunks of potato seemed almost identical to traditionally cooked patatas bravas. It certainly had none of the delightful crispiness found in triple cooked chips. There was at least plenty of taters to go round. Although far from spicy, the mildly smoky paprika and moderately garlicky aioli prevented this dish from becoming a total chore to eat. Things picked up with the arrival of the mussels. The firm, fresh, zingy molluscs were served in a thin yet rich and buttery sauce. It was hard to appreciate, though, without spooning whole mouthfuls into my gob. 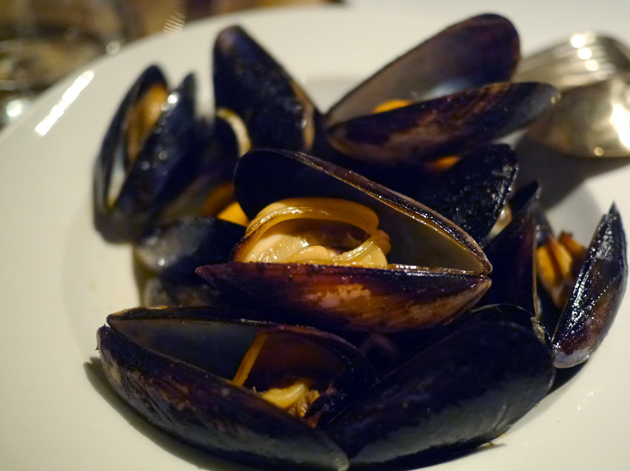 Still, this bowl of moreish mussels was far better than the ho-hum variety served at Belgo. 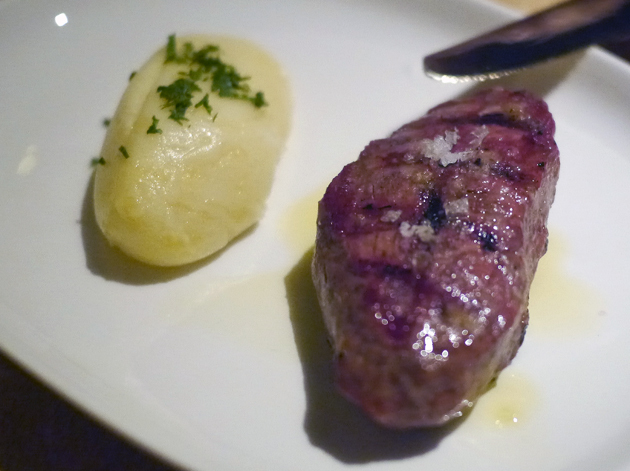 Although the secreto de iberico didn’t quite have the same depth of flavour as similar cuts of pork available elsewhere, it was still very moreish. 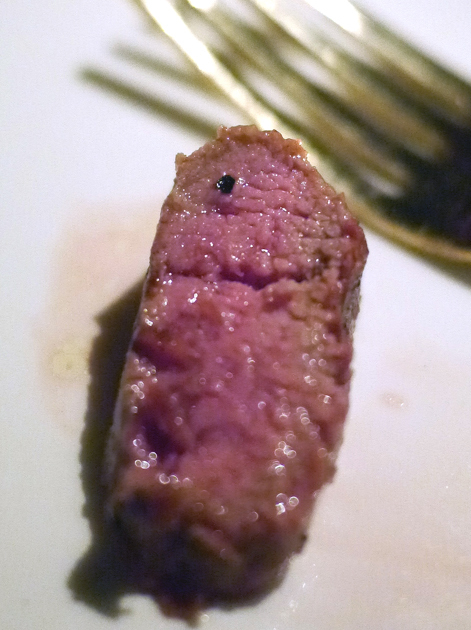 The tender, moist chunk of pork was cooked rare/medium rare with a gentle combination of sweetness and saltiness. Beef cheeks and mash sounds very British and not especially Spanish, especially as the promised iberico pancetta was nowhere to be found. 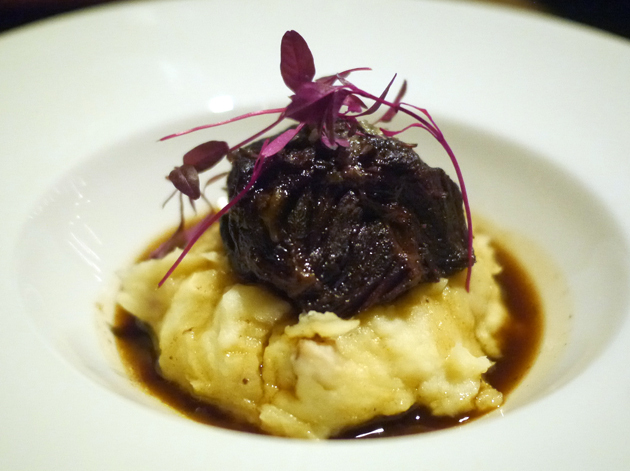 While the dish was competently done, the tender cheeks meshing well with the fluffy parsnip mash, it wasn’t very distinctive with similar versions of this dish found in many other London restaurants. 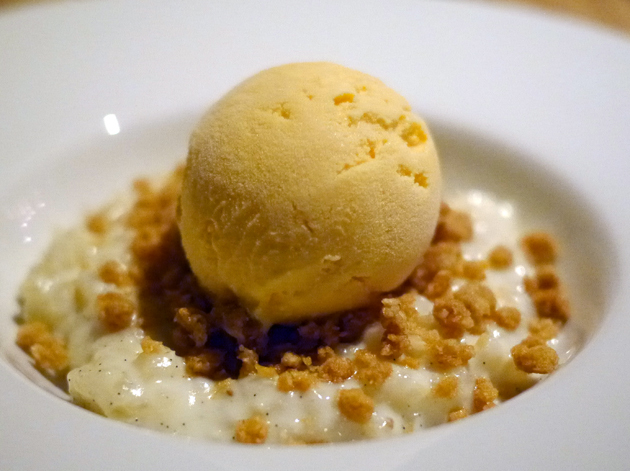 The Squelchie’s lemon and cava sorbet tasted mostly of lemons, which was emphasised further by a mild lemon curd and and a dash of crunchy biscuit crumb. The Squelchie found it all a little fussy, but to no great effect. 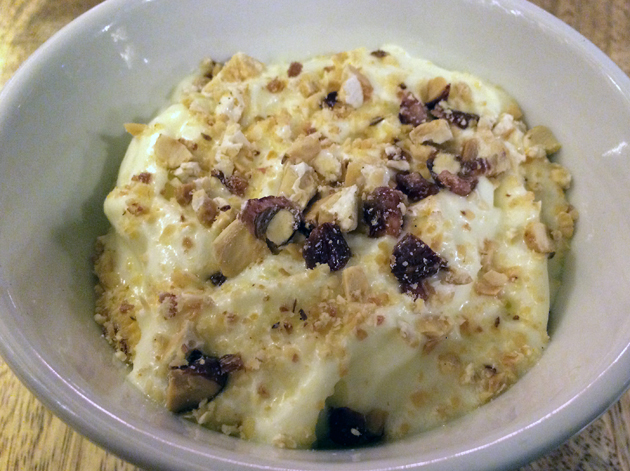 The same biscuit crumb popped up again as a topping for a lumpy, mildly creamy rice pudding. 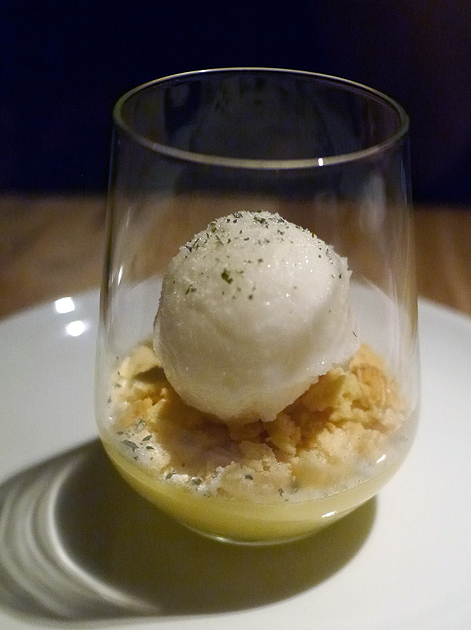 If it wasn’t for the boozy touch of honey, this dessert would’ve been utterly forgettable. 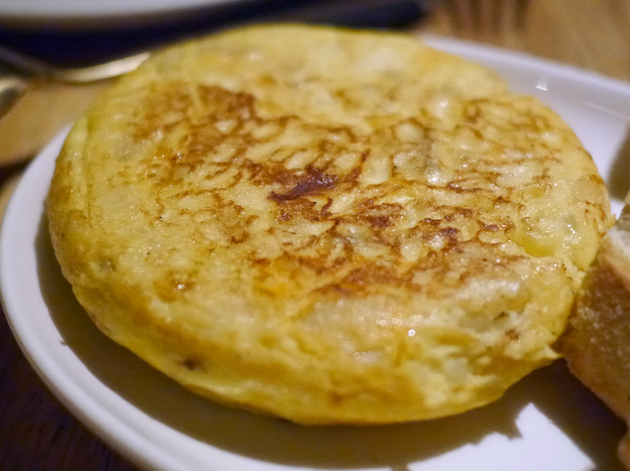 I returned to Bilbao Berria to give the kitchen another chance to shine, but without the company of the Squelchie. 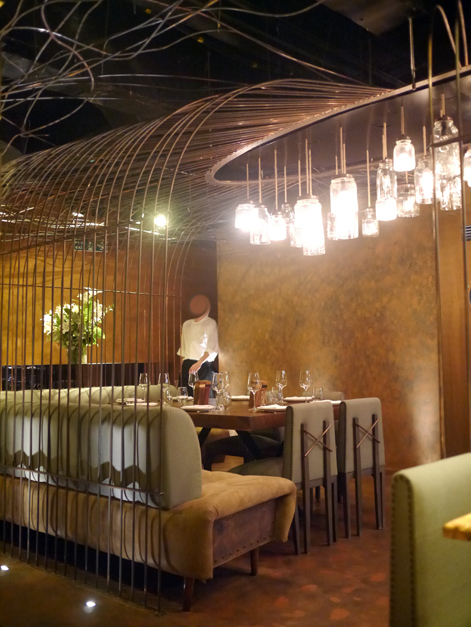 At least the service was more polished and efficient this time around; on my first visit the staff seemed unsure of themselves and took seemingly forever to get anything done despite having only a handful of tables to look after. 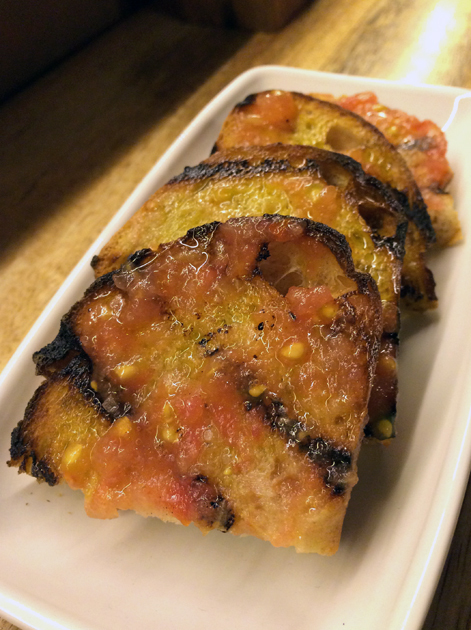 Tomato bread can be simple yet incredibly tasty, but this tapas staple is often done in a mediocre, slap dash way. The toasted bread here was fluffy with a crisp crust and dressed in a grassy olive oil, but the light smearing of tomato puree had only a very mild umami kick. 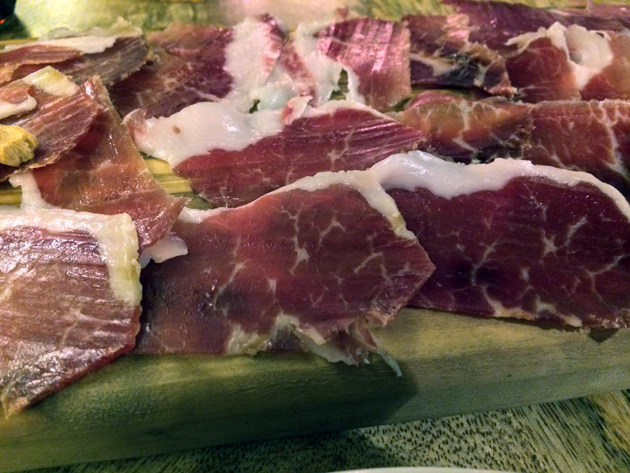 The jamon iberico de bellota wasn’t as luxuriously marbled with fat as the best examples of this cured ham, losing much of its depth of flavour. It was nonethless still enjoyable, with a mild soy sauce-like saltiness to it. Ah, to live the life of an acorn-fed pig. Or perhaps not. 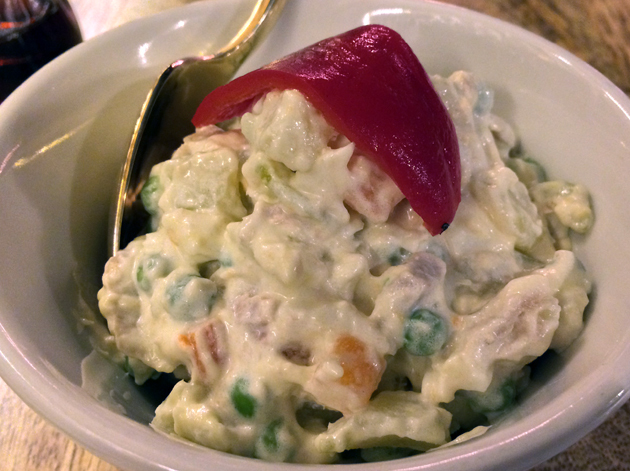 Few things are more baffling than the Russian salad, a peculiar dish that is apparently quite popular in Spain. The blandly creamy salad of avocados, tuna and assorted random vegetables was an inoffensive mixture of mush. Expect to find it at your local Tesco within the year. In Soviet Russia, salad dodges you. If I awarded kudos based purely on price, then the lobster rice would be showered with plaudits. At £22, it’s by the far the most expensive tapas dish I’ve had anywhere. 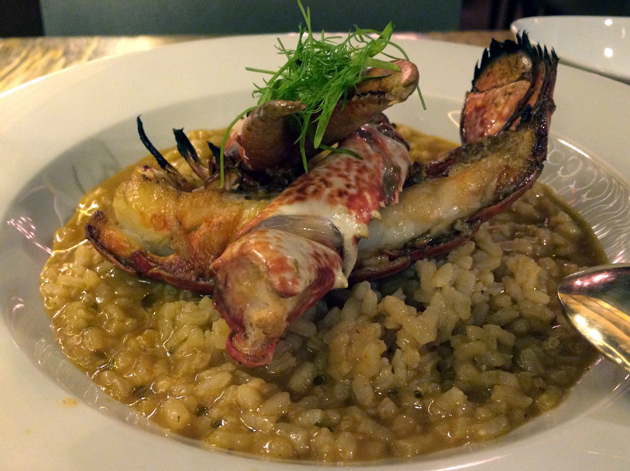 The small, roughly quarter serving of lobster thankfully included the tender, milky claw. 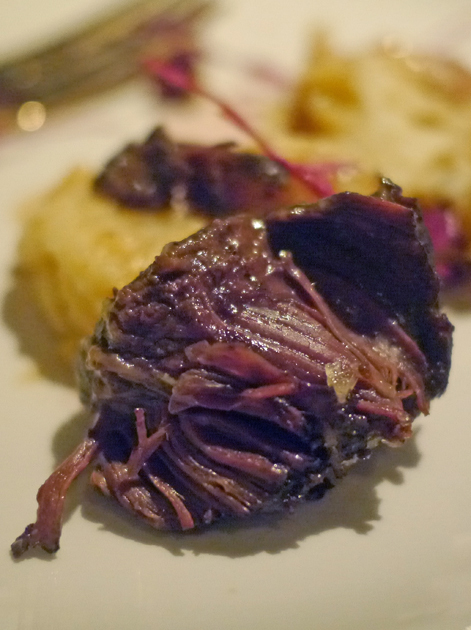 The tail and leg meat had a rich, buttery, boozy taste that was quite sumptuous, although it obviously won’t sit well with those who prefer the cleaner, uncluttered flavours of undressed lobster. The loose, big grained, mildly paella-like rice wasn’t as fragrant as I would’ve liked though. In the end, not even the richness of the meat was quite enough to justify the high price of this dish – whole cooked lobsters are available elsewhere for less. 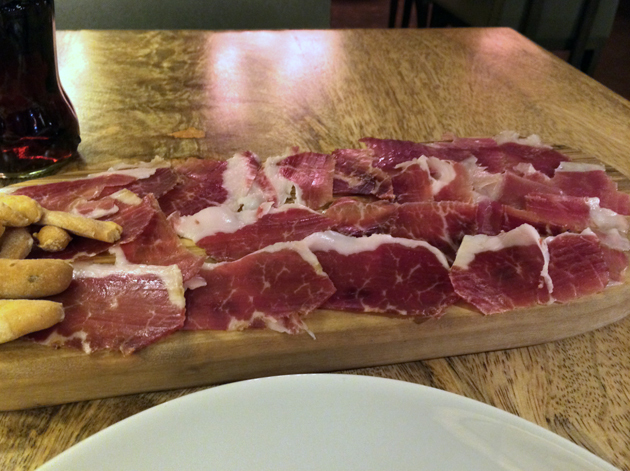 Plus, this really does stretch the definition of tapas to breaking point – this dish really isn’t made for sharing. Pork belly is a luxuriously fatty cut of pig – a confit preparation of pork belly should therefore be a decadently unctuous, delicious dish. What I got instead was a mildly smoky side of pork, with a mildly rendered layer of fat. Mildness is not a good stand-in for fatty, moist, waxy strips of heart stopping decadence. 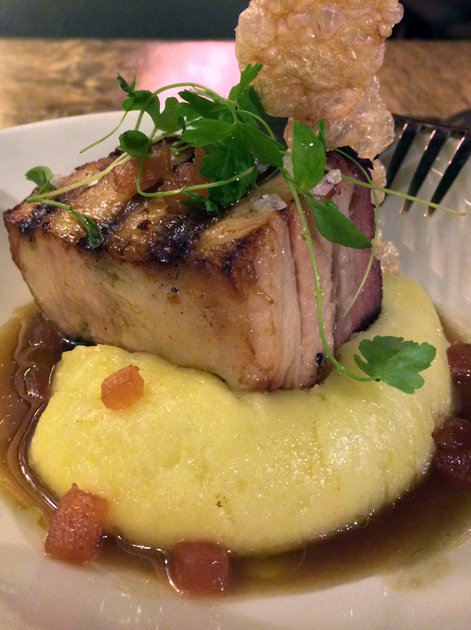 At least the sweet tartness of the quince mash suited the smokiness of the pork well, but this was a small consolation. It was hard not to think of Ferrero Rocher when chowing down on my chocolate ganache dessert. Although smooth, soft, light and wispy, the ganache appeared to have been made from an inoffensive milk chocolate which was severely lacking in character. Moderately more interesting was the light almond cream and the crispy, crunchy, crushed almond pieces scattered on top of it forming an upper layer atop the ganache. Still, neither of these were enough to make this dessert truly satisfying. You can’t see the chocolate ganache underneath, but trust me – you’re not missing anything. Pointing out a restaurant’s mediocrity is never a pleasurable endeavour. It means that despite their blood, sweat and tears, the hard-working kitchen staff have fallen short, and at Bilbao Berria they’ve fallen very short indeed. The so-so, average food is so by the numbers, that there’s very little reason to eat here unless you can’t get a table at somewhere better. Opening Hours: Sunday-Wednesday noon-14.30 and 18.00-22.00. Thursday-Saturday noon-14.30 and 18.00-22.30. Tags: almond, anchovies, bilbao berria, bread, cheeks, cheese, chorizo, jamon, lobster, london, mussels, patatas bravas, pluma iberica, restaurant, review, rice pudding, salad, secreto, sorbet, tomato. Bookmark the permalink.